The Rolex Sky-Dweller is exactly the kind of watch you usually don’t think of when you think of Rolex: a complicated watch, and moreover, one with a very unusual implementation of several complications. For that reason, it’s not very often discussed by Rolex fans, but in typical Rolex fashion it is, as it turns out, much more interesting than you might think from the niche in which it sits in the Rolex lineup. Available only in precious metals, the Sky-Dweller was introduced in 2012 and there was, at the time, a lot of buzz about it; but as one of the most expensive (non-jewelry) Rolexes, it’s been more visible (when it’s been visible at all) as a luxury watch rather than as a tool watch. There’s no doubt from the minute you pick one up that the Sky-Dweller is very much a statement piece; it’s big (42 mm x 14.1 mm) and very boldly styled, with a light-gathering fluted bezel and enough reflective surfaces to ensure that pretty much no matter how the light hits it, it’s going to dazzle the eye. An unobtrusive tool watch, this is not – certainly not in terms of style. We wore the Everose-gold version of the watch for this installment of A Week On The Wrist, although we also had the white-gold version (on a white-gold bracelet) for comparison purposes as well, and they’re both pretty flashy watches; there’s just no getting around it. 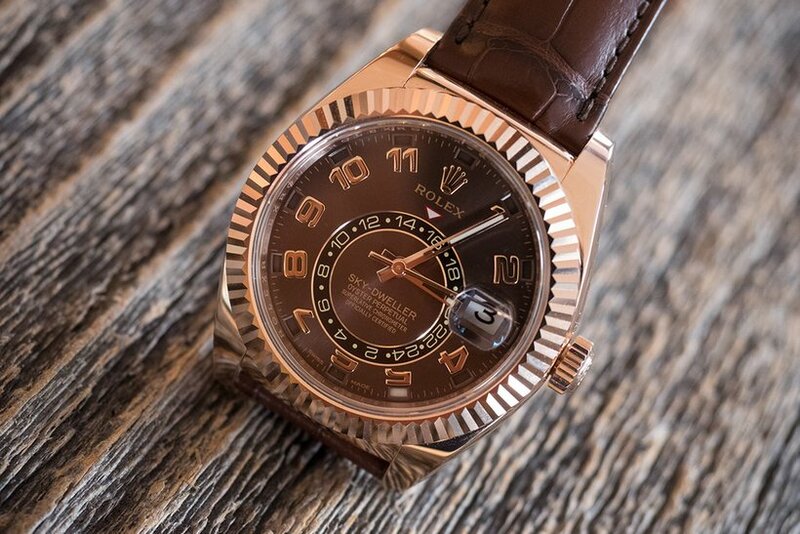 However, that doesn’t necessarily mean they come across as gauche, either, and what you notice right away, as is usually the case with replica Rolex watches, is that everything’s extremely well done. Dial furniture, casework, hands, overall fit and finish – everything is absolutely immaculate and really sets a standard for build quality and quality of execution in luxury watchmaking. Yes, you expect that at this price point, and yes, you expect it from Rolex, but given how seldom luxury watches really deliver in this respect it’s nice to see anyway. 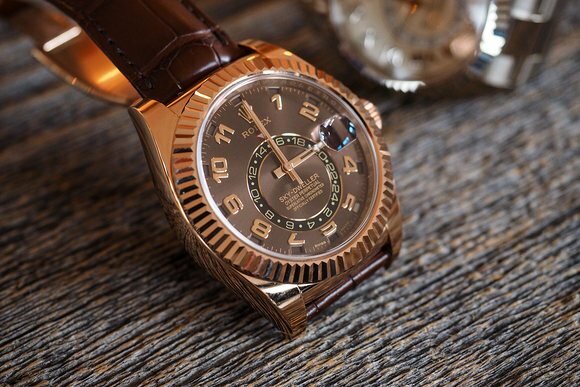 The fact that the Sky-Dweller is so well made goes a long way toward saving it from ostentation, and I think that’s because the very high quality seems an end in itself, as well as a manifestation of a deeper commitment to quality for its own sake. It’s a very characteristically Swiss approach to luxury, I think; you don’t necessarily get originality and artistry the way you do from the French or Italian approaches but you do get, at best, meticulous attention to detail in an object that radiates a craftsman’s pride in their work. It’s a banker’s rather than an aesthete’s level of the expression of luxury, but it seems to work for replica Rolex – a kind of luxury that’s half lavishness in materials and construction, and half an absolute, ironclad guarantee that there will be no unpleasant surprises. On the wrist, the impression created by the arresting visuals of the Sky-Dweller continues: they’re massive, yes, but on my seven-inch wrist they were also very comfortable to wear, as both watches fit closely and remained centered on the forearm without any noticeable play. The Everose model on a strap was a very comfortable watch to wear over the course of a week, size and weight notwithstanding, and for long-term wear I think I’d prefer it to the bracelet just from a mass standpoint. 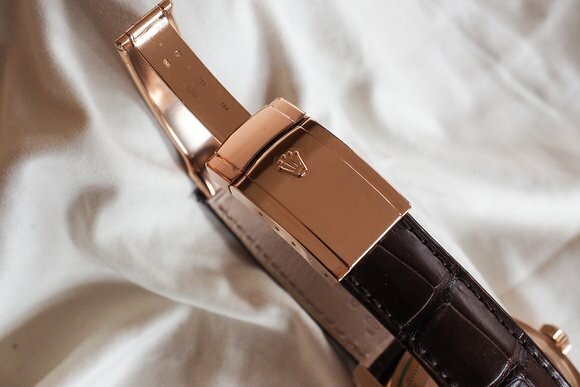 (The strap is fairly thick and it distributes the mass of the watch pretty evenly, which also goes a long way toward making this a comfortable watch to wear.) However, if you are the sort of person who wants to wear this watch on a matching gold bracelet you’re also probably the sort of person who is not going to be deterred by a few (well, a lot of) extra grams of gold. 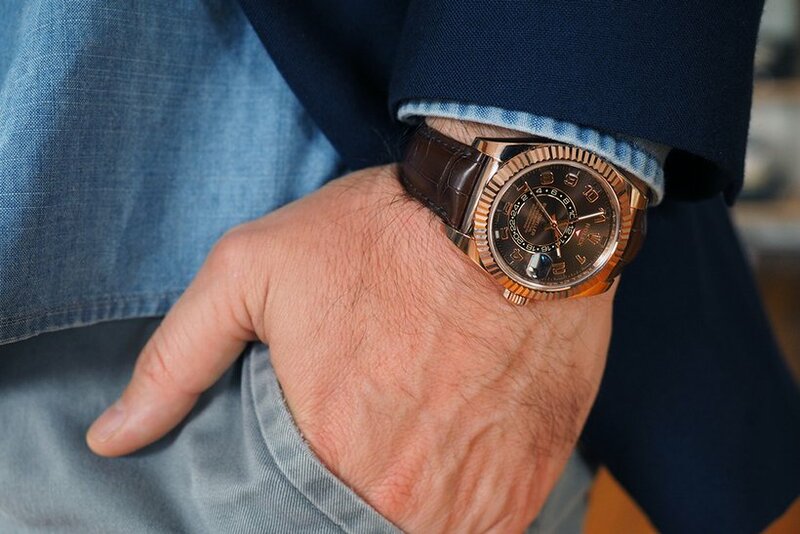 Part of what makes this a comfortable watch to wear despite its mass is probably that the lugs curve down sharply enough to prevent a gap between your wrist and the back of the watch. The Sky-Dweller is a watch with a purpose, and that purpose is to make keeping track of the date across multiple time zones as painless as possible. It’s an annual calendar, dual time-zone watch in which all indications can be set by the (screw-down) crown. 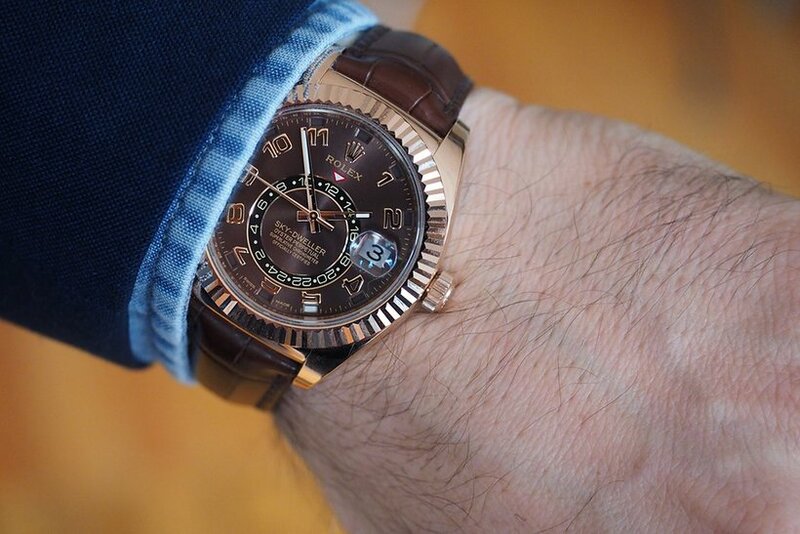 The unique feature of the Sky-Dweller is the “Ring Command” rotating bezel, whose position determines the function of the crown. The crown has two positions; unscrew it and pull it out to the first, and it can be used to hand-wind the movement (exact fake Rolex caliber 9001). Pull the crown out to the second position, and, depending on which position the bezel is in, you can use it to set the time, set the hour hand to local time, or set the date (there is also a neutral position for the crown as well). The annual calendar is synchronized with the hour hand, so that if you happen to be traveling between the 30th and the 1st of the next month (in a month with 30 days) the calendar will automatically skip the 31st if you set the time ahead past midnight to the new time zone. The month is indicated by a colored rectangle in one of the 12 apertures around the dial, and home time is via the 24-hour ring occupying the lower two-thirds of the dial. Operation of the Ring Command bezel and crown is very straightforward. The bezel has crisp detents at each position and hand setting of all three indications (time, independent hour hand, and date) was precise as well. The Sky-Dweller, during the period I wore it, showed almost no detectable change in rate at all; in a week of daily wear (including a flight to Geneva and back) it gained about 1.5 seconds, so you won’t need to handle the crown very often (once a year at the end of February, of course) but when you do, you’ll have the pleasant feel of interacting with a piece of robust, well made, and well designed machinery. The Sky-Dweller shines visually, but it shines functionally as well; in traveling with it, I found it to be an extremely enjoyable watch to use as it was designed to be used. The only potential hiccup is that there’s no way of knowing, short of memorization (or manipulating the crown) which position the bezel is in, so you can find yourself inadvertently setting something you don’t mean to set. I’m not sure if a solution to this is either necessary or desirable; in the abstract, it seems it would be a problem but in practice, it’s pretty much a non-issue, as any of the indications can easily be set forward or backward on the off chance you change something you didn’t mean to change. I suppose the worst that could happen is that you pull the crown out to the second position and find you’re in time-setting mode, which would mean the seconds hand stops momentarily until you push the crown back in again. I found legibility under all conditions to be excellent (include a dark aircraft cabin during a red-eye to Geneva) despite the relatively small amount of lume present (relative, anyway, to Rolex’s technical models). The Sky-Dweller is a bit of a conundrum. It’s a technically advanced watch, and a pretty complicated one from a company not generally known for its complications. It’s also a luxury watch, designed to be a pretty highly visible indication of affluence (albeit it’s extremely well made, which gives it a more dignified overall vibe than not). At the same time, it’s a niche enough watch that it’s actually more stealth than you might think; one of those Rolexes that, despite the date cyclops, doesn’t read as instantly as a Rolex as, say, a Submariner, Daytona, or Day-Date. Complicated gold watches generally don’t sit in the sports watch category, yet this is also a sport watch, at least to a degree; both its size, and a number of its technical features (including that screw-down crown and a water resistance of 100 meters) seem to keep it in the sport watch category rather than the dress watch realm. 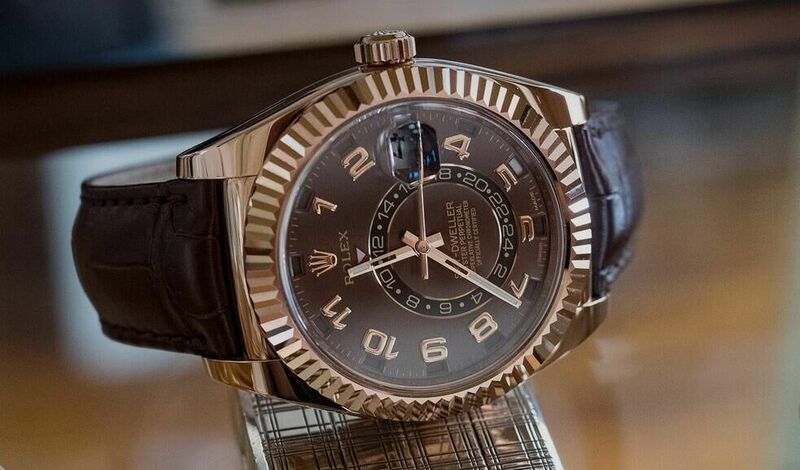 I think the solution to some of the initial confusion you might feel when encountering the Sky-Dweller is that it really isn’t a watch that inhabits any one traditional category especially: yes, it’s a luxury sport watch, but unlike Rolex’s other luxury sport watches, it’s not a precious metal version of an existing steel model. The Sky-Dweller is not the simplest solution to telling time across two time zones quickly and easily, of course. 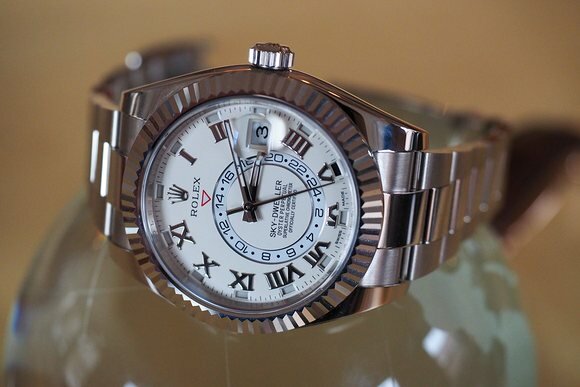 On a certain level, if that’s what you want, and you want to do it in a durable, accurate, very well made and quietly stylish mechanical watch from Rolex, well, you get a GMT Master II or an Explorer II and call it a day. But I don’t think the point of the Sky-Dweller is to be the simplest answer to a particular need. The Sky-Dweller reminds me very much of another complicated Rolex: the Yachtmaster II Regatta Timer (which we went hands-on with last year). Like the Yachtmaster II, the Sky-Dweller fills a very particular niche by filling a practical need with almost hyperbolic sophistication on every level imaginable, both mechanically, and from a materials and design standpoint; and like the Yachtmaster II, it is a very particular take on a very particular complication. 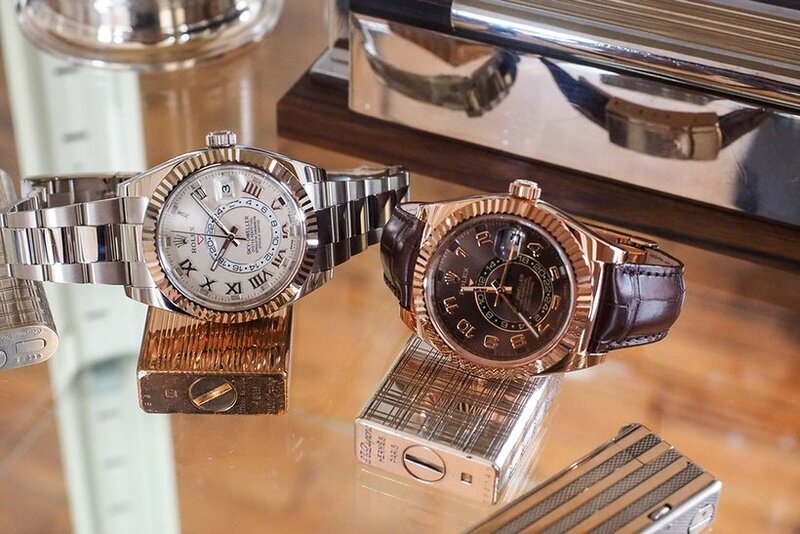 The Rolex Sky-Dweller, in Everose on a strap, $39,550; in white gold on a matching white gold bracelet, $48,850. Case, 42.00mm x 14.10mm, water resistance 10 bar/100 meters. Movement, selfwinding cheap replica Rolex caliber 9001 for man, bidirectional winding with 72 hour power reserve. Paraflex shock system with Parachrom balance spring; overcoil with free-sprung adjustable mass balance under an adjustable balance bridge. Chronometer certified by the COSC; maximum deviation in daily rate, -2/+2 seconds per day. Ring Command bezel for selecting function of the crown in its second position; annual calendar with indication of the time in two time zones.